It’s just a golf tee, a small piece of wood barely weighing an ounce. But when you bent to pick it up after finishing the last hole, it may as well have been a 300 lb barbell. You felt your back pop and now the searing spasm is setting in. How could such little thing cause such a big problem? What you didn’t realize is your spine had been going bad for some time now. At some point, your vertebrae lost their alignment – possibly a few months ago from a minor slip or maybe from years of neglect. 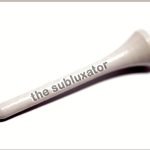 Subtle nerve pressure ensued (subluxation) and now your muscles are doing just about all they can to keep you upright. Bending over on the 9th green was literally the last tee that broke the camel’s back. When a minor act turns into a major injury, it’s not what you did that concerns your Chiropractor the most – it’s what you’re NOT doing that does. Let it be a lesson pay more attention to the maintenance needs of your spine. Do the smart thing – stay regular with your spinal adjustments to prevent a repeat event.